While being involved with David Morton in the creation of a 3D of the Temple for my location (contributing the measurements, layout and design for him) I have come to understand a great deal more about the Temple. One of those things concerns the many animals brought in for sacrifice. How did they get into the Temple? Where were they sold? There were many thousands of animals brought in on a single day, such as Passover, and other feast days or celebrations. We know from the scriptures that on the north city wall, that Nehemiah repaired, was the Sheep gate. Also a gate right around the corner on the city wall was the Miphkad gate. The gate that is there now is a Muslim built gate that some people call the Golden Gate, believing it to be the famed East gate of the Temple Mount, but Nehemiah rebuilt the city wall only, not a single wall of the Temple in his account. Deep below this gate is an ancient gate believed to be the original gate Miphkad that Nehemiah spoke of. Miphkad has much to do with the Red Heifer. The word means inspector and was probably where the final inspection of the red heifer took place. However it is written that only nine red heifer sacrifices took place from the time of Solomon until the destruction of the Temple in 70 AD. Sheep and cattle were kept separate, as they are today. So I believe the young bulls that were needed for sacrifice were most likely brought in through the miphkad gate. Goats would have been brought in through the sheep gate. So let's begin this study with how the animals were brought into Solomon's/Zerubbabel's Temple. Solomon's Temple had no west gate, the north gate later became damaged and was not rebuilt. So these animals were not corraled in the north court. or they would have had a great need to repair the damaged. A new north gate was built by Herod when he extended the north court. The East gate was entered into by way of Solomon's Porch/Portico and entered directly into the Women's court. The Women's court was not a place for the corralling of the thousands of animals needed. It had other functions. This only leaves the southern court for the corralling and sale of these animals. Once inside the city wall enclosure the animals had to be managed and then herded to the Temple and into corrals, where they would be sold to the Jews coming to the Temple to make a sacrifice. This was a big business. At one point a famous High Priest and his family owned all of the shops, and overcharged, which made the people very upset. The family were the richest people in the city. 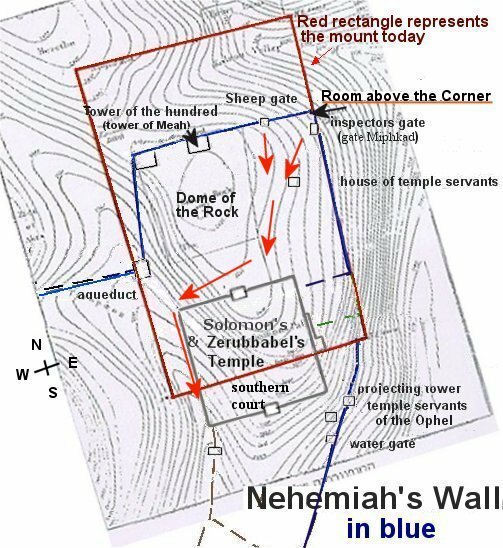 In this map the Nehemiah wall is shown with blue lines. The Tower Meah later was enlarged, with many towers added, and called Fort Baris. Fort Baris did not connect with a wall to the temple, but had an underground passge from the fort to the temple. This left open land for the many animals to be coralled and then herded in groups into the temple via the west side of the lower southern court. The red arrows indicate the path of the animals on these maps. The lower court was the southern court of both Solomon's/Zerubbabel's temple, and also Herod's Temple It was Josephus that called this court the Lower Court, because the Temple was on a higher part of the hill. The Herodian extension of this lower court, by Herod's grandson, was most likely only begun in the time of Jesus and wasn't completed until a few years before the Temple was destroyed in 70 AD. On the western side of Solomon's Temple there was a man-made drainage ditch which flowed at the bottom of the Tyropoeon Valley and ultimately emptied into the Kidron Valley. The maintenance for these corrals would have required small drains going down to that drainage ditch to handle the copious amount of urine needing to be drained away. This leads me to believe the animals were corralled on the western side of the southern court. Before the Herodian's extened the courts, the Tyropoeon Valley was a steep valley on the west side of the Temple. 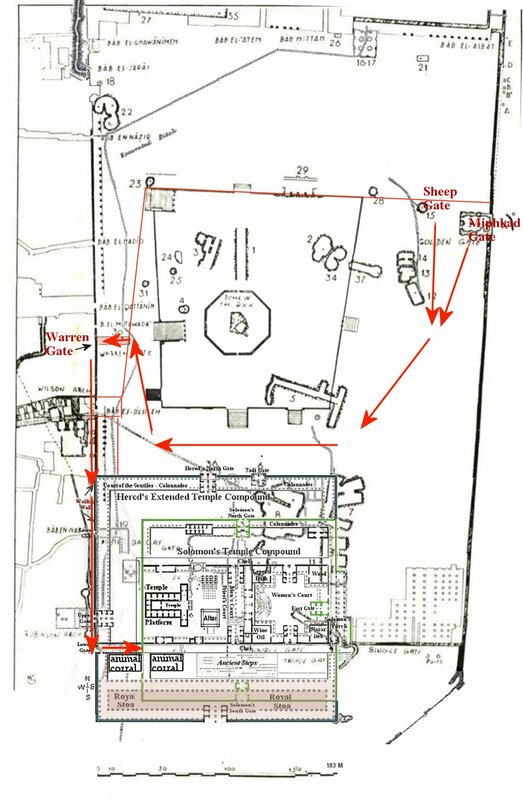 A walkway or path needed to be built along the west wall of the Temple for the animals to be brought into the west side of the southern court from the Sheep and Miphkad gates at the north end of the city wall. 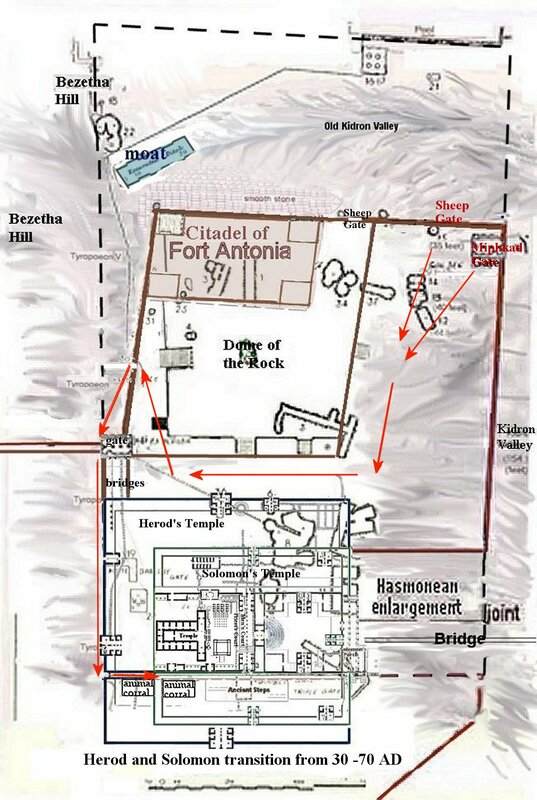 This changed when Herod the Great built Fort Antonia in place of Fort Baris and connected Fort Antonia to the Temple with a wall. The path for the animals was cut off and had to change. Herod the Great died in 4 BC but the work continued on the west wall with Herod's son, Herod Agrippa I, and later the southern court was extended under his grandson, Herod Agrippa II. 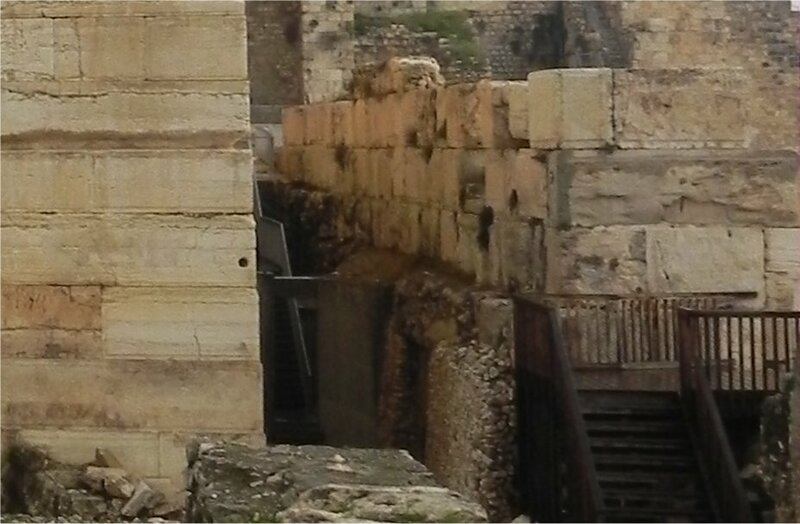 When Herod Agrippa I began building the west wall northward in a straight line, as it is today, then a tunnel was needed to connect from this new wall to Herod the Great's west wall, which was angeled following the path of the Nehemiah wall. This tunnel, or gate, is named Warren's Gate, after the explorer Charles Warren and is shown on his maps. So the animals were herded from the sheep and Miphkad gates around to the new tunnel going from the old west wall to the new west wall as shown in the next map. With the Herodian's building of the west wall the Tyropoeon Valley was filled in and brought up to the street level of the west hill, and a first century street was built along the west wall. The street, however, was built for people not animals. To accommodate the animals the Herodians built a string of shops along the west wall with a walkway on top of the shops. At the level of the top of the shops both Warren's gate and Barclay's gate have their thresholds. The animals entered the walkway through Warren's gate and continued southward, but some of the animals could be brought up through Barclay's gate to a barn in the upper west court to be sold. This would be where people entering from the west by means of Robinson's arch bridge could purchase animals for sacrifice. The rest of the animals were brought down to the alleyway between the upper court and the southern/lower court. In this alley were two separate entrances, one for sheep/goats and one for young bulls. The arched entrance, which I believe was for the young bulls, and the red heifer, can still be seen in the alley today. This illustration below shows the path they followed to reach the alleyway. When the 3D of the Temple is complete, many months from now, we will be making a video showing how the animals entered the west side of the southern court of the Temple.